It is always great to see our young musicians performing. Emma Powell undertook a challenging exam performing four different pieces on three percussion instruments (kit, timpani and marimba), in front of a good sized crowd and an examiner. The performance at the Christchurch Music Centre Chapel (Barbadoes Street) was a wonderful disply of Emma’s talent and certainly proved to us all that percussionists don’t just “hit” things. 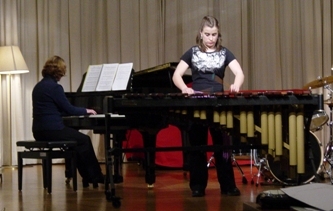 The musicianship and skill shown by Emma was a tribute to the many hours she spent practicing for this performance/exam. The examiner thought so too – congratulations Emma on your EXCELLENCE grade for this exam.